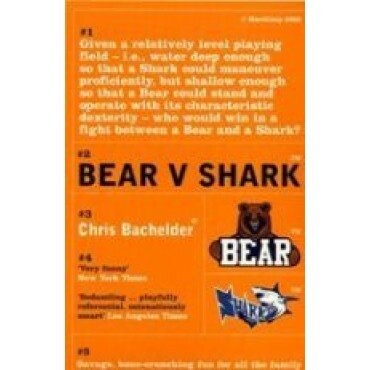 In this brilliant satire of our media-saturated culture, Las Vegas is to host a spectacle - - Bear v. Shark II. A basic question is being asked: 'Who would win if a bear got in a fight with a shark?' All of America is desperate to get a ticket but it is young Curtis Norman who, with an essay entitled 'Bear v Shark: A Reason to Live', wins a national writing contest and four tickets to the show. As he and his family head across the country, they are besieged by a dizzying barrage of TV and radio personalities, Freudians, theologians and more, as the whole country bets, debates, takes sides and argues over who is going to win. His father, Larry Norman, is having a silent crisis, and these meaningless exchanges leave him a little disenchanted and world-weary, so it is in an ambivalent mood about the impending event that he finally arrives in Vegas with his family in tow, for what turns out to be something of an apocalyptic climax.